The Texas House voted this evening 91 to 55 for preliminary approval of HB 1774, one of the #BlueTarpBills pushed by the insurance industry and their allies this session. The bill slashes penalties for property insurers that wrongly delay weather-related claims, pushes cases into federal courts where it takes twice as long to receive justice, and threatens access to justice by increasing costs, delay, and risk for those wronged by insurers. The bill has broad application beyond hail claims and would impact millions of Texas property owners if signed into law. "This dangerous legislation helps cheating property insurers pocket more illicit profits through delay schemes. It rewards the worst insurance companies the most and punishes property owners with valid claims. It is a giveaway to the insurance industry -- more special privileges for special interests. "The insurers' preferred bill drives up costs, delay, and risk for property owners who have been wronged by insurance companies. 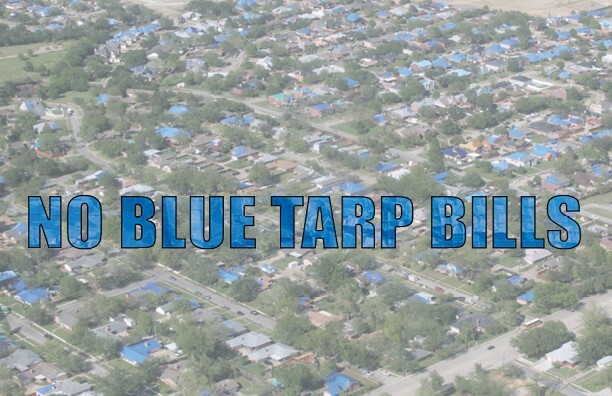 Blue tarps will blanket this state when property owners can't rebuild. "It is a matter of public record who stood with the insurance lobby. The fight for property owners' rights will continue this session." Texas Watch, a non-profit, non-partisan citizen advocacy organization, has worked to protect policyholders since 1998. Texans across the board want policyholders' legal rights protected. Learn more at www.texaswatch.org/protectpolicyholders.